There’s a saying that history doesn’t repeat itself, but it does rhyme. If that’s true, there’s a poem going on at MIT right now. The first line happened nearly a century ago when MIT planned its shift across the river from Boston to Cambridge. In 1912, George Eastman, the founder of Eastman Kodak Company, made the move possible with a $2.5 million donation to fund the construction of the main academic complex. Not even the members of the Corporation knew the source of the millions. For years, no one was in on the secret except President Maclaurin, his wife, and his secretary. And the need for secrecy created awkward moments for President Maclaurin. In 1916, an ambassador from MIT boarded a train to upstate New York to ask Eastman for money to support the Department of Chemistry. An embarrassed Maclaurin sent a hasty note. “I have just heard by accident that Mr. A. D. Little, a member of the Corporation of the Institute, is going to Rochester today … I could not dissuade him from his project without revealing your identity as a benefactor,” he wrote to Eastman. Eastman did meet with Little and agreed to donate $300,000 although, perhaps to obscure his role as Mr. Smith, he made the gift public. Ultimately, Eastman gave substantial sums of his fortune to higher education, with the University of Rochester as the largest benefactor. MIT received nearly $20 million—most of it anonymously as Mr. Smith. So why is history rhyming at MIT? Because similarly modest donors continue to shape our campus today. The grande dame of the dormitory system, Old Ashdown House, presides over the gateway to MIT at the corner of Mass. Ave. and Memorial Drive. 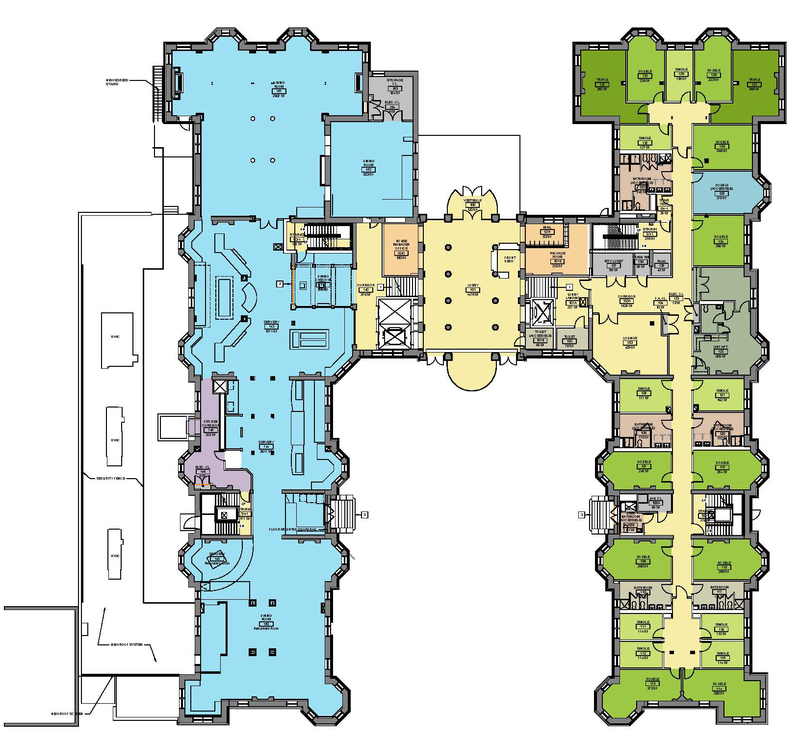 We have a new Ashdown House now: NW35, which houses graduate students in the northwest corner of campus. W1, as we now call the majestic residence, has been gutted and is in the midst of a complete renovation. When the financial crisis threatened to bring work to a halt two years ago, anonymous gifts ensured that the project moved forward. To date, unnamed benefactors have given $20 million—crucial funding at a critical moment. Eastman’s generosity laid the foundation for MIT’s academic buildings at the start of the last century. We may not know the identities of the current set of “Smiths,” but we can be certain that they are helping to set the cornerstone for residential life for the next century. Whoever they are, every Mr. or Ms. Smith has our thanks. Have You Checked Out OCW Recently? This photo, of vendor Mike Jones arriving at an antiques show/flea market with his dog, was taken by an MIT student in the Documentary Photography and Photojournalism class. Click photo to view more. In one year (2008-2009), 4,727 courses were made available online—an increase of 58%. More than 250 institutions have published some 13,000 free courses online. Courses are available in more than eight languages. And, OCW has improved the supplemental resources section, which includes online textbooks, multimedia content, image galleries, and exams and assignments (with and without solutions), among other things—all categorized by discipline. So if you’re looking for a textbook for calculus, fluid dynamics, or electromagnetic field theory; video demonstrations in lasers and fiber optics; or examples of student work from intro writing subjects, you’re in luck. Be sure to check out student photos from the Documentary Photography and Photojournalism class. You’ll see a day in the life of a Boston Latin history teacher, how scuba divers celebrate Easter, and the real story and characters behind an antiques show and flea market. Women have always been a minority at MIT, albeit a growing one, and a new student group, Graduate Women at MIT, seeks to support the personal development, individual growth, and empowerment of all graduate women while enhancing connections among existing women’s services. In 2009, 31% of grad students were female (compared to 45% of undergrads), a number that has increased 55% in the past 15 years. GWAMIT founder Kay Furman wanted to ensure that valuable resources were not underutilized by this growing population and that their needs were addressed Institute-wide. At the internal kick-off dinner, sponsored by the MIT police, Sergeant Cheryl Vossmer and Captain Al Pierce spoke on the role of MIT police on campus and legal issues in domestic violence cases. GWAMIT will host a spring kick-off week April 26-30 (coinciding with Sexual Assault Awareness Week) that will include a keynote speaker, negotiation and invention workshops, panel on work-life balance, and more. Here’s where you can help. The group is currently seeking collaborators, sponsors, and panelists for the week as well as other programs in the works. Are you a successful alumna? Have you studied women’s issues or workplace interactions? Could you lead a workshop on a particular skill set (i.e. leadership, negotiation, etc.)? Contact GWAMIT. GWAMIT’s upcoming plans for the 2010-11 school year include a mentoring program, fall leadership conference, and spring empowerment conference. Check out the Web site to learn more (some events will be open to all alumni), join the student and alumni membership list, and support GWAMIT. Some 20 women, representing various schools and departments, attended GWAMIT's internal kick-off dinner. Front row, from right: executive board members Megan Brewster, Kay Furman, and Jean Yang. What did you do during IAP? Ernie ’12: Over IAP, I became more Korean, won the 6.190 competition with Ryan, took UPOP, played hockey, went to church, and coded websites. Jason ’10: I danced excessively for various dance groups on campus. Pooja ’11: I worked at a strategic healthcare consulting firm, Decision Resources, as an analyst. Dan ’11: Bonded with the fam. And I guess the LSAT. Claire ’11: I did the 6.470 web programming competition and went on outdoor adventures with Winter School! Giulia and Diana ’11: Studied for the MCAT! Kimmee ’12: I was in course 4 studio 28 hrs a day. ‘Nuff said. Ohhhh but I got an A for the class! Juhee ’13: Worked in the admissions office! Ariadne ’10: I practiced twice a day for the varsity swim team, worked for UPOP (the undergraduate practice opportunities program) and attended a course on project management in Vermont. Elizabeth ’13: I went to Disney World! Evelyn ’12: I worked at Donorschoose.org – a great nonprofit in NYC. Troy ’13: I enjoyed the sun back home! Tina ’12: I set up a chapter of Leadership Training Institute in Brazil. Jamie ’11: I did an externship at a Medical Devices start up! Leigh ’10: I took an HST class in which I dissected a cadaver. Jess ’11: I participated in MLK Seminar and completed an installation about minorities in media. Chris ’10: I backpacked through Europe with 2 of my friends- 10 countries in 31 days! Tom ’10: I built a ceramic water filter factory in Northern Ghana. Beth ’10: I ice climbed and hiked in the pretty Patagonian mountains of Chile! And finally, a friend who shall remain nameless, just walked into my room after having a little too much fun at a Super Bowl party at his frat. I asked him to tell me what he did during IAP in a sentence. “I just worked in my…” His eyes widened and he was silent for a few moments. With that, he turned on his heel and walked out of my room. I’m worried for the cellies [sic]. A university’s Web page is an institution’s new front door since many prospective students virtually visit colleges these days and alumni are scattered worldwide. Good thing MIT is on top of that. In fact, MIT’s Web site has just been named the top university Web site by 4 International Colleges and Universities, which bills itself as an online directory of accredited, four-year institutions around the world. A New York Times article wrote: The Massachusetts Institute of Technology was deemed No. 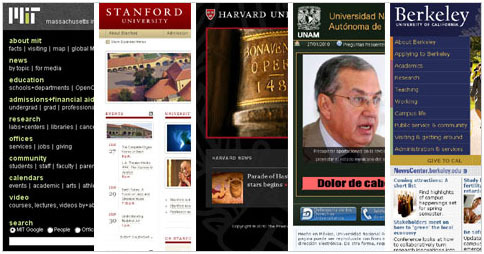 1 in Web popularity, followed by Stanford University, Harvard, the Universidad Nacional Autónoma de México, and the University of California, Berkeley. In fact, OpenCourseWare Executive Director Cecilia d’Oliveira says MIT has been ranked #1 for several years by a Spanish research group’s Webometrics Ranking of World Universities. That ranking is based on global performance and visibility of the universities with points given for criteria ranging from Nobel prizes to highly cited researchers to size of the site. The MIT Web site has well over one million pages! 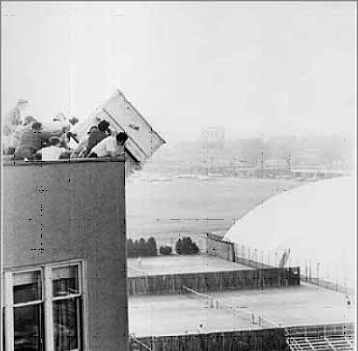 Archive photo of the annual Baker House Piano Drop. As campus-wide preparations step up for the 150-day celebration of MIT’s 150th birthday, set for spring semester 2011, the MIT Museum is reporting the results of the popular vote for items to be displayed in the MIT 150 Exhibit, a collection of items that depict Institute life and culture. Some of you were definitely watching and voting because when we reported it in Slice on Nov. 10, the count surged. “Hacking” had just edged past the “Baker House Piano Drop” as number one. However, a boost by Baker backers returned the piano to top ranking. And that helped secure the lead for good.